Operators of machines within 1km of schools to be fined NIS 226,000; complete ban will take effect in two years. As of Wednesday, December 21, it is against the law to install cigarette vending machines within 1,000 meters of schools and other educational institutions. Starting on January 1, 2014, the use of tobacco vending machines will be completely barred. The delay for the complete prohibition resulted from objections by vending machine companies and others, who said they would lose money and needed time to make up for their losses, although proponents of an immediate ban said vending machines for cigarettes could easily be changed to sell anything from stamps and envelopes at the post office to healthy foods and toys. Last May, the government decided on the basis of Health Ministry recommendations to adopt a national program for reducing smoking and damage from tobacco, especially among children and youths. One of the regulations was to bar tobacco vending machines in two years and those within a kilometer of educational institutions now. The ministry said it plans to enforce the rules against vending machine owners who violate the law; the fine will be a prohibitive NIS 226,000. Until now, although cigarettes cannot be sold legally to minors, any child could buy them from vending machines. A northwestern Pennsylvania tobacco shop is turning the image of the jovial, pipe-smoking Santa on its head by having Saint Nick huff on a hookah. Up In Smoke store manager Sue Stoyer says that customer reaction to the display has been mixed. 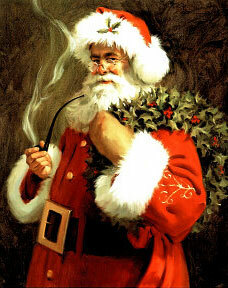 But she notes that many early depictions of Santa Claus have him puffing on a pipe. Clement Moore’s “A Visit from St. Nicholas” includes a reference to the jolly old elf clenching a pipe in his teeth, with a ring of smoke around his head.The tiny town’s holiday parade earlier this month made the window a source of both amusement and scorn. But Stoyer shrugs off any criticism. She says Santa’s history as a smoker is on the shop’s side.